The Write Taste Review of Mannings Apple Juices. 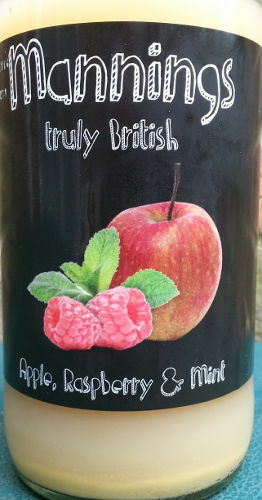 Mannings, a family company from Herefordshire, produces apple and pear juice with the emphasis fully on flavour. They grow Jonagold, Cox’s Orange Pippin, Discovery and Russett apples plus Conference pears in their orchards. Carefully selecting and hand-picking the fruit, they use a traditional rack and cloth press to extract the juice. A small amount of natural Vitamin C is then added to preserve the colour, while the juice rests in barrels prior to bottling. Mannings juices will keep for three days in the fridge after opening, with a shelf life of 18 months. In this report, I will be reviewing three of their juices, all of which use Jonagold apples, a cross between the Golden Delicious and Jonathan varieties, developed in New York in 1953. These are particularly good for juicing, imparting a naturally sweet, crisp, tangy and slightly honeyed flavour. Mannings have produced three different cloudy apple juices from the Jonagold variety, all between medium sweet and sweet in flavour. An aromatic nose of freshly grated apple with a gentle hint of raspberries and mint in the background leads on to a tangy palate. The raspberries add a bracing tartness, while a light touch of mint imparts a refreshing coolness, which remains on the finish, enhancing, rather than overpowering the apple flavour. This is another aromatic apple juice with gentle hints of lemon juice and lemon zest on the nose, leading on to a palate bolstered by an invigorating lemon zing. There is a good finish with the sweetness of the Jonagold apples and the refreshing lemon notes persisting in the mouth. Natural ginger flavouring is added to the apple juice to create this smooth, yet invigorating pick-me up, with the ginger notes coming through more on the end-palate, adding a delicious, yet subtle touch of spice. Any of these full-flavoured apple juices would make a refreshing summer cooler, or would be great as a non-alcoholic pairing for a hearty meat stew. Enjoy!